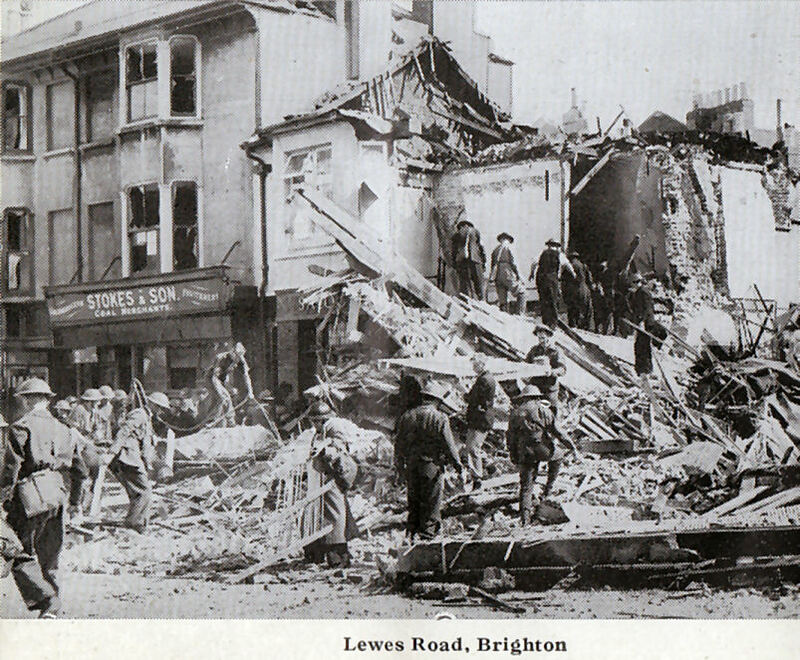 On Friday 20th September 1940, The Lewes Road Inn, was completely demolished as the result of a direct hit in a ‘hit and run’ raid by the German bombers on Brighton. There were several casualties, some of which were fatal. As rescuers fought their way through the wreckage of the inn, they heard the landlord Ernest Scully, calling. He was trapped with his wife and their dog. The rescuers talked to the landlord as they continued to drag away the debris. After searching for three hours they found Ernest and his wife Rosina; unfortunately they were both dead. Ironically their dog, a small white terrier, was found unhurt in the wreckage. As they continued to search for survivors, the rescuers heard cries coming from another area. A volunteer crawled through the wreckage of the saloon bar and found three people in the cellar, sadly not all of them survived. One of those killed was a window cleaner who had been passing the pub on his cycle at the time of the bombing. Betty Marchant, a popular barmaid at the inn, was rescued four hours after the bombing. She had been serving behind the bar at the time of the bombing, and dropped to the floor. Luckily, the bar collapsed over her and protected her from more falling debris. Although badly injured, she remained conscious and talked to her rescuers as they worked to free her. The inn was rebuilt as The Lewes Road Inn, but was later renamed the Franklin Tavern. I did hear a story that the window cleaner was claening the windows of the pub when it was bombed. Dear Jennifer, I have a photo of the pub taken after the bombing showing the very extensive damage and the ARP team searching through the wreckage. The photo would fit very nicely between the two, and would help to document the history, if you could insert it? Let me know if you want it and I’ll scan and email it to you? My uncle Jim Frew was killed in the bombing raid. He was home on leave from the army and he was due to go back to barracks the next day. The barmaid said later that he had just ordered his drink when the bomb dropped. The beam from the ceiling came down and caught him on the side of his head. My Aunt and Grandparents lived in Hastings Road, and were on the scene before the dust had settled. He not only left a widow he had an 18 month old daughter as well. My parents told me it was a plane which was being chased back over the channel by the R.A.F. and he just dropped his payload in order to get away faster. My parents had to go and identify him in the mortuary which at that time was in Hodshrove Road, they said he had no mark on him except for were the beam had hit him. Thanks Jennifer, it looks very good and completes the story! If anyone has any doubt about the 3 photos please look at the chimney behind on the old photo, which can still be seen in the WWII photo and the new photo, although from slightly different angles. It also looks like the coal merchant Stokes & Son building was demolished to make way for the new “bigger” pub! Thanks for your story Chris, its really great when bits of the jig-saw fall into place and we get an overall story. I have had the photo for about the last 20 years, and was aware of the general story. Just by chance when Jennifer and Councillor Geoffrey Wells put the 1900s and current photos, plus story together, my bombing photo fitted perfectly in-between theirs. Now you have filled in more gaps, with an almost first-hand account, which is great for our local history. It’s worth also looking at the 1946 bombing map on this site; look under maps on the left hand side. You will see, if you zoom in, it shows the bomb on the pub and the other one you mention, which is shown as landing in-between St Mary Madgalene St and Caledonian Road. Thanks again for the story of that dreadful day! I was crossing the playground at Coombe Rd. school when I saw the German bomber which released the bombs, one of which destroyed the Lewes Rd. Inn. I reported it to the teacher, but was told to sit down and not to be so silly, whereupon there were two big bangs and the air-raid siren went off. My mother and aunt were returning from the market and were almost at the pub when the bombs landed. Fortunately they only lost all the eggs they had managed to get hold of when they hit the deck! The bomber, a Heinkel 111, seemed to be just stooging around and was probably having a go at the railway viaduct which once served Kemptown Station. By the way, can anyone remember a german bomber being chased by one of our fighters at very low level down Milner road as we were leaving school at lunch time? I was slung into the shelter of a wall by an Allen West worker, but I was having none of that and quickly managed to watch the planes swoop over the barracks and climb over Ditchling Rd. hill. My grandad, who was in the back garden at 112 Milner Rd., threw his rose sprayer at the bomber! I found it in the road when I eventually got home and at first thought it was something dropped from the planes! I remember my mum, (who lived in St. Martin’s Place), talking about the Inn being bombed. She said that the air was full of feathers from the feather pillows. I have been interested to read the comments and see the photographs, as I am writing a piece about the Back family who lived near the Lewes Road Inn, and can remember their windows being blown out by the bomb. The children were sent to stay with their grandparents in Barcombe, while the house was repaired. I would like to use the photograph of the bomb-damaged Lewes as an illustration. I have been unable to contact Peter Groves. Does anyone know where I can contact him, or who owns the copyright of the photo? Editor’s note: Your request has been forwarded to Peter Groves. Just a couple of lines about the bombing of the Lewes Inn: My father, now 96, lived in the house next door at the bottom of Franklin Road and had done so for thirty years. Dad was at sea when it happened and his mum was out shopping.The dog mentioned in the story told was named Ruffy and was my father’s dog, not the publican’s, and it was home in the lounge when the bomb hit. He also said that, had it happened a week prior, it may have been worse as they had billeted evacuees in the pub. I have an envelope which was returned with the advice written: House bombed… Also have a photo of the dog. The house was looted before the dust had settled. Hope this has been of interest. My father was in the garden at Crescent Road when what he said was an ME109 nearly knocked the house chimney off. They could see the pilot. ME109s were used for hit and run attacks. They only carried a couple of bombs. I worked at Allen West in the 1970s. 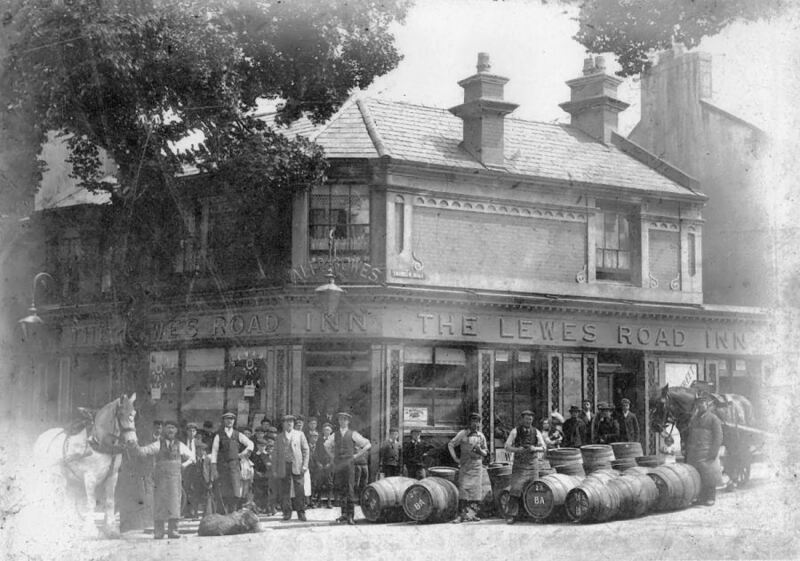 There were people still working then who were at the Lewes Road premises when the pub was hit. Apparently it was just prior to lunch when the explosion was heard. The police ordered the Allen West management to lock the gates and let nobody leave. They were not sure whether the bomb had landed north or south of the old railway arch. As you can imagine rumours started flying. One claimed that Cox’s had been hit! It appears the people who survived the blast in the cellar subsequently were killed by gas from a damaged main which leaked carbon monoxide into the cellar. Fond memories of the Lewes Road Inn. My dear friend Duncan and I enjoyed many a pint there in the early 80s. He was a gentle giant who supported many a weeping lady with problems. Love him until this day. My mum and me had been down Lewes Road shopping. Just as we got indoors we heard this awful noise. As we got to the back door the bomb exploded on the pub and a second one in Caledonian Road. It was a terrible fright. (One of her friends was killed). I also remember the incident in Coombe Road school with the plane crash. I was 11 at the time and we all rushed to the air raid shelters. I lived in Riley Road. My name was Dorothy Holden, my sister was Joan Holden and my Mum and Dad were Julie and George. If anybody knew my nan or her family and would like to get in touch she would love to hear from them, it would really make her day. My Dad Bill Bennett had just left the Pub, the Lewes Road Inn with his brother in law who lived at No. 8 Franklin Road, the home of my Grandmother Charlotte Tennent when the bomb struck the pub. If it had been a few minutes earlier they would have both been in the pub and I would not be here. 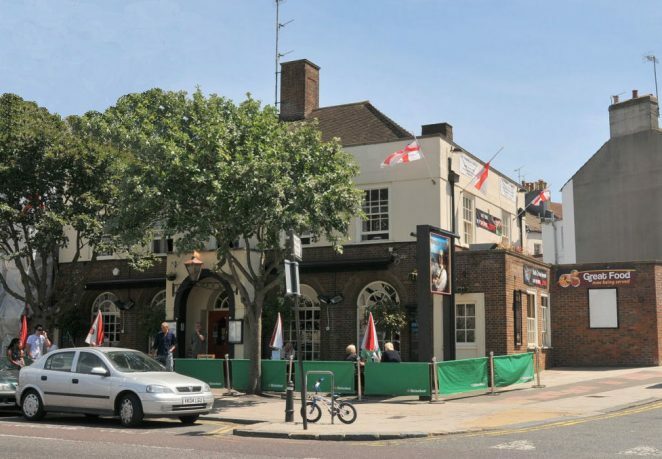 I remember visiting my Grandmother a few years later and large fencing was still surrounding the site which continued to do so for many years afterwards until the new pub was built. It was before the bombing took place and for quite a few years after it was built a meeting place for members of my family. My Uncle still lived in Franklin Road up to the time he died in 1999. My mum has often told me of that day. She was four years old and she had been out with her aunt to the dairy that used be along the Lewes Road. I think where the memorial masons used to be. They had just passed the pub when the sirens went off. My aunt made her run home which was St Martin’s Place when the bomb dropped and all the windows blew in. When they went out to have a look all the bikes from the shop on the corner of Franklin Road (where the SPA shop is) had been blown across the pavement. It was after that that she was moved to the safety of Herefordshire for the duration. But her grandad had to stay in Brighton to look after the house!